New Stuff - HUGE update today! 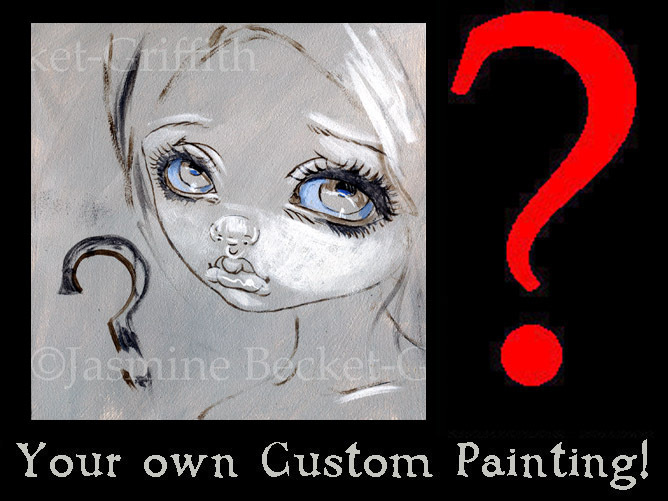 Firstly - a "Jasmine Paints LIVE" event is scheduled soon at Pop Gallery Orlando at Downtown Disney here in Florida! 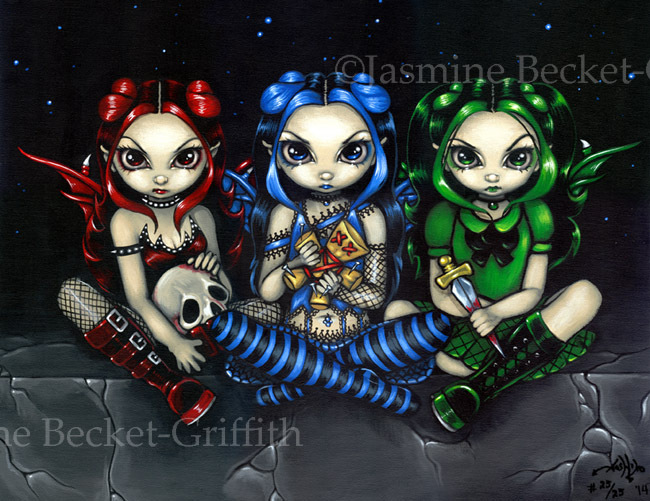 Mark your calendars - Jasmine Paints Live will be August 16th. In other Disney news, I'm stoked about my Maleficent T-Shirts at Disneyland, some WonderGround Exclusive Disney pieces of mine that are popping up now in (Gasp!) Florida (Gasp! 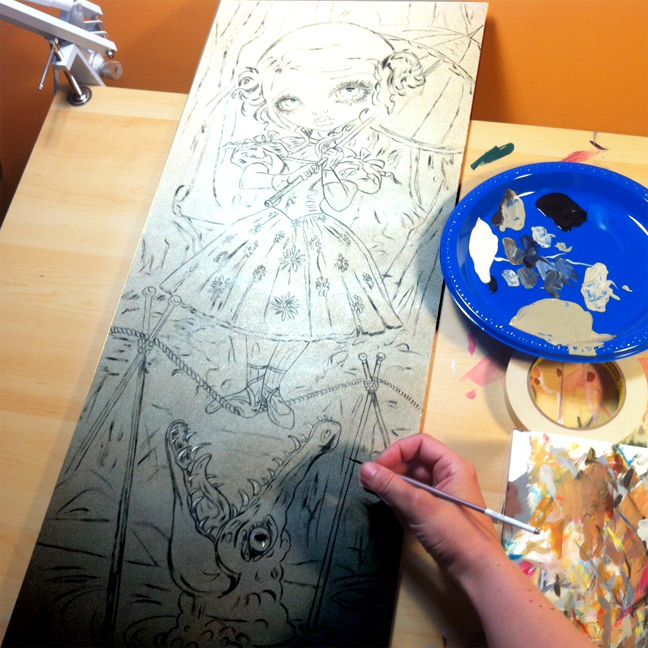 ), and a new work-in-progress photo to show you of my Haunted Mansion "Tightrope Girl". And finally, some great authenticated paintings of mine up on the secondary market to tell you about (including one piece from when I was a student - ha! ), and the auction for the LAST Wicked, Tricksy & False Lt. Ed. Canvas ending tonight. Scroll down for all of this & more! "Faces of Faery 222 & 223"
Both of these Faces of Faery paintings were the results of my "Custom Faces of Faery" auctions on eBay, painted to the winner's specifications, and they turned out great! 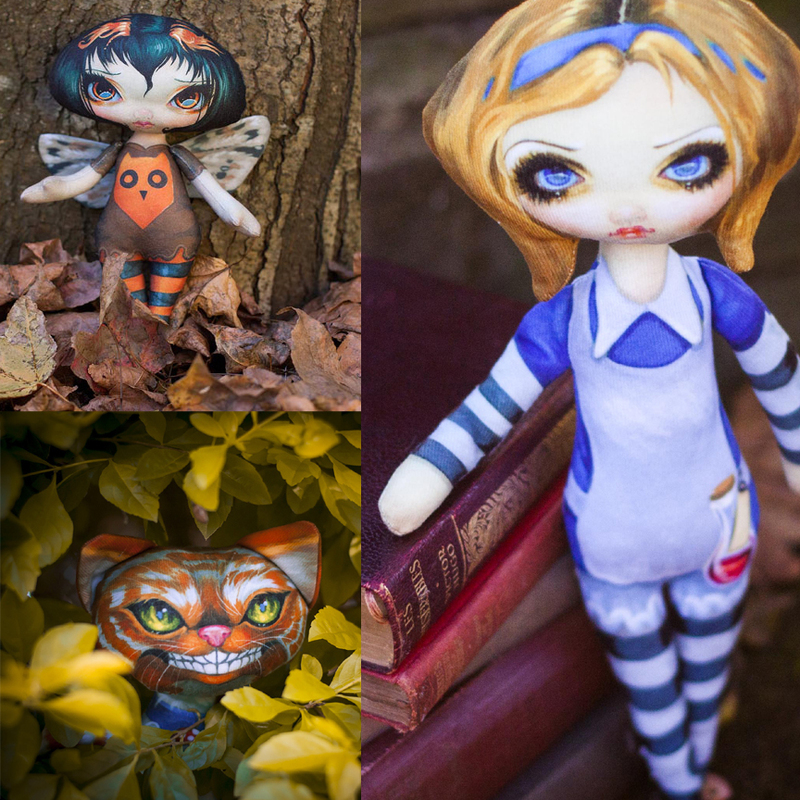 and we are debuting the two new dolls "Alice in Wonderland" and "Cheshire Cat" - along of course with my previous "Owlyn" Owl Fairy. Each doll is hand-sewn out of cloth by either my Mom or my sister-in-law Sarah! 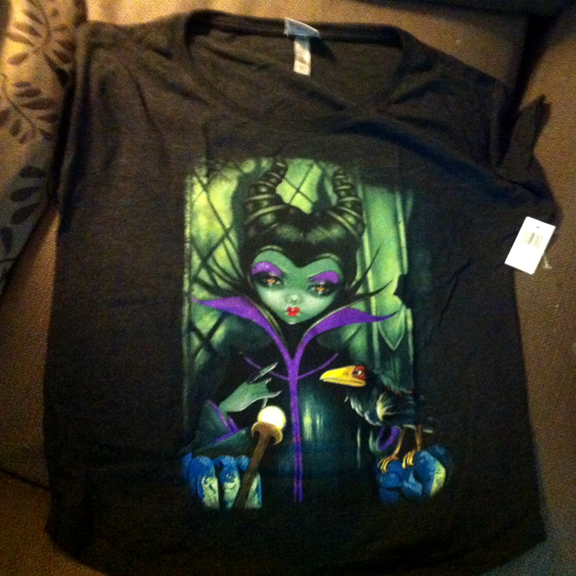 My Maleficent shirts are at Disneyland! Dolman style ladies' shirts featuring my Disney painting "Maleficent Enthroned" - they are black and gorgeous and are $34.99 at Disney's WonderGround Gallery at Disneyland in California. They are exclusive to the gallery, but luckily the gallery ships WORLDWIDE. Ask for Jasmine Becket-Griffith's "Maleficent Enthroned" shirt from WonderGround Gallery, they take orders via email at:merchandise.guest.services@disneyparks.com or by telephone at: 877-560-6477 I don't know the complete range of sizes but I know for sure I saw size Small up through XXL at least. No - you can't have this one, it's mine! They also have canvases, mini canvases, postcards, prints & and 3d magnets too. Work-in-progress for my October 11th event at Disneyland's WonderGround Gallery - this big long painting features the "Tightrope Girl" from Disney's Haunted Mansion (she is balanced over the alligator as revealed in the "stretch room" portraits). ©Disney & contracted by Disney, this acrylic painting (and prints, merchandise, etc.) 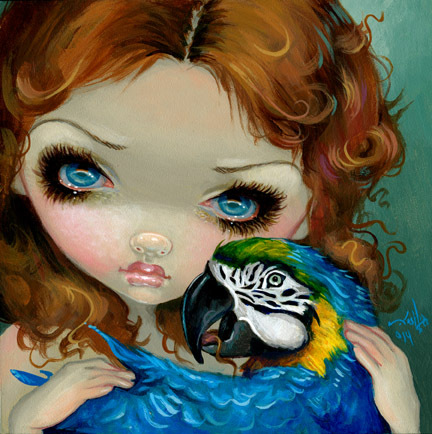 will debut October 11th at Disneyland's WonderGround Gallery at Downtown Disney in Anaheim, California! I'll be there in person, of course! Still loads of work to do, this is just the basic sketch as Disney has approved it so far. It's going to be very detailed and hopefully quite lovely! Now at Downtown Disney in Florida, you can see my WonderGround Exclusive artwork at their Marketplace Co-Op store on the "Marketplace" side of Downtown Disney. They have a few selected images & items available as shown in the pic above, and may be adding more soon. These are specifically my Disney character pieces. Also while at Downtown Disney here in Florida you can find my flagship gallery Pop Gallery Orlando which has the largest selection of my artwork in the world, my personal works & special exclusives found nowhere else. 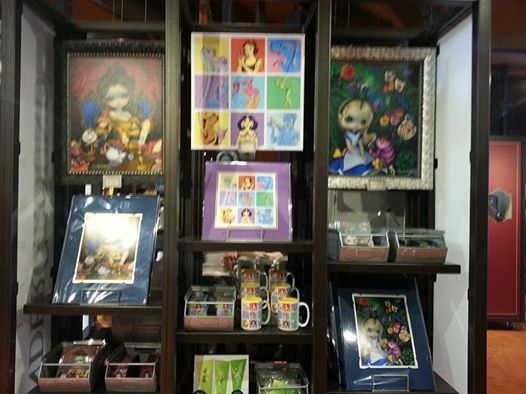 Pop Gallery is located on the "West Side" of Downtown Disney / Disney Springs, by the AMC Theatres. Make a day out of it, and stop by both! An early classic of mine from 2005, this is the last chance to snag a Lt. Ed. Canvas, hand embellished by me in acrylic paints. Remember, all my Limited Edition Canvases really are "limited" and they do indeed sell out! You can always find my Lt. Ed. Canvases at strangeling.com , at Pop Gallery Orlando, at WonderGround Gallery, and of course in my Strangeling eBay store! Click here to see what's up for sale now on eBay - some GREAT deals!